The Black Magick Reverb amplifier adds artist-requested features to the award-winning recreation of the vintage Supro amp loaned by Jimmy Page to the Rock and Roll Hall of Fame Museum. Developed in collaboration with Lenny Kravitz, the Black Magick Reverb captures the mid-range grind and signature sound of the original model—while adding all-tube reverb, 2-band EQ and a master volume knob for maximum flexibility. 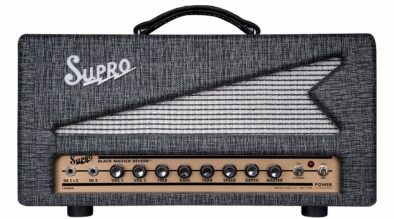 The amp is available as an all-tube head or in a 1×12 combo format. « All the tones I need in one amp. Now with classic spring reverb, » says Lenny Kravitz. 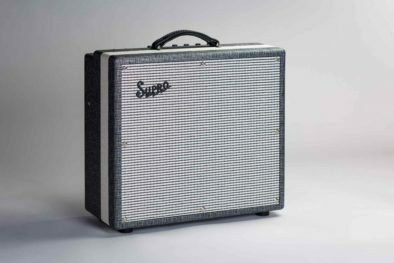 Supro amplifiers are distributed in the UK, ROI and Europe by JHS. The Black Magick Reverb head retails for £1,299 and the combo version is £1,529. Both are shipping now to Supro dealers. Mesa Boogie lance son premier ampli acoustique ! Nouvelle série d’amplis Vox MV50 à découvrir !